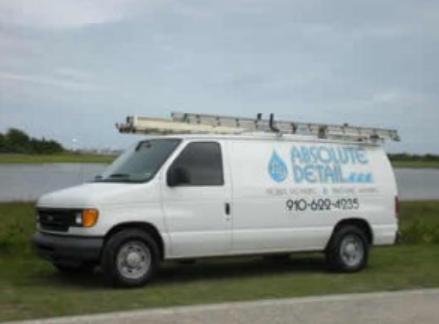 Pressure Washing Wilmington NC – Here at Absolute Detail, we take pride in preserving the value and beauty of your vehicle and home. All of our services are performed on site by a qualified pressure washer/detailer. We use only the best, most effective blend of chemicals to give optimal results. Absolute Detail provides service to siding, brick, concrete, driveways, walkways, decks, fences, pools, parking lots, restaurants, apartment complexes, parking garages, and gas stations. Restore that “new” look – who doesn’t like things that are clean and new? You want to put your best foot forward in this world, and you want the same for your home or business – being covered in grime is not the way to do that! Maintain your home’s/business’s building longevity: Built up dirt, grime, and air pollutants can cause permanent staining to your home or building’s exterior. And that can become a lot costlier to repair than a simple pressure wash! And you can apply that equation to almost anything you can pressure wash – how about the cost to replace a fence vs. a simple, professional power wash? The numbers will speak for themselves! We are available for both residential and commercial work. Our pressure/power washing services are offered in: Wilmington, Wrightsville Beach, Carolina Beach, Monkey Junction, Leland, Ogden, Hampstead, and Holly Ridge. Call Us Today at (910) 622-4235 for a FREE Quote! Do you hook up to our house water? Yes but we can bring our own for an additional charge. Depends on the job size. An average 1500 Sq foot home will use about 200 gallons. 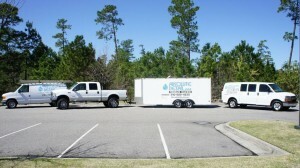 Cape fear public authority charges approximately $8 per 1000 gallons of water and sewer. Will my plants be OK? Yes, they will be fine with our chemical cleaning procedure. We do a very thorough rinse to make sure any residual chemical is washed away. How long will it take to pressure wash my home or driveway? That all depends on the actual job size. After doing 1000’s of homes, the typical vinyl sided, 1500 Sq foot home takes about 30 min with a couple of machines running. We have done homes before that have taken a full day. But, they were extremely large homes. A 4 car driveway can take about 30 min to pressure wash, rinse and apply a coating of chemical to ensure the best job. Will you cause any damage to my home with the pressure that you use? No damage will be done because we use a LOW PRESSURE procedure to clean your home. Is there anything that I have to do prior to you getting to my home? All we ask is that all windows be closed and locked. Remove any items on your porch or patio. Tables, chairs and grills are fine to leave out. We are more concerned with cushions, electronics and anything breakable. We’ve been doing business and satisfying customers in Wlmington, NC since 2005! Fully licensed, bonded, and insured – we’re ready to take on any job. Comprehensive list of referrals available upon request. Fully owned and operated by a Marine Corps Veteran. Mention Online Coupon Code: SALEEN and receive $75* off of a Home and Driveway Pressure Washing Package!